It is increasingly recognized that the ultimate goal of agriculture is nutrition and health of the population. Yet, linkages among these sectors in designing and implementing programs and policies that complement and reinforce their goals remain weak. This is largely due to inadequate capacity to address challenges faced jointly by these sectors. Low levels of individual sector capacities add to the burden of developing multi-disciplinary capacity to address policies and programs that will have implications for the related sectors and thwart achieving the full nutrition and health benefits of agriculture in many developing countries. Yet, serious efforts to develop such multi-disciplinary capacity in Africa remain limited. This journal, AJFAND, is an exception, and a pioneering effort in Africa to develop a practical platform to bring together multi-disciplinary scientists to address common technological, institutional, and policy issues related to food, agriculture, health and nutrition. Its achievement over the last decade, in building multidisciplinary capacity remains unparalleled. In this paper, we look at the past successes in developing multi-disciplinary capacity and what can be learned to further new approaches and applications. Developing multi-disciplinary capacity for agriculture, nutrition and health is nowhere more urgent than in Africa for several reasons. First, several countries in Africa still lag behind in their effort to achieve the Millennium Development Goals, although some progress has been made towards that end. Second, African countries remain vulnerable to the high level of food prices, which not only makes millions of people vulnerable to hunger and malnutrition, but also has negative implications for health outcomes. Third, African countries continue to be vulnerable to man-made and natural disasters that reduce food levels which have serious food security and nutrition implications for the affected population. Finally, emerging issues such as HIV/AIDS, climate change, food safety, and transmission of animal diseases to humans are influenced by, and influence agriculture, nutrition, and health sectors. Addressing these issues has implications for related sectors and will require multi-disciplinary capacity. However, efforts to develop such multi-disciplinary capacity have not been fully successful in the last forty years. Several issues militate against successful development of multi-disciplinary capacity for agriculture, health and nutrition. First, the development goals are pursued without giving due consideration to the need to integrate the food and agricultural system with health and nutrition outcomes. This is partly due to insufficient development of concepts and methods for analyzing such multi-disciplinary approaches to address food security and nutrition challenges. Second, due to single disciplinary training of the experts in related fields, it has been a challenge to bring them together to discuss various aspects of food systems, nutrition challenges, and health related issues that require linkage at the planning, policy making, and program implementation levels. Third, the interactions of agricultural production systems with health and nutrition systems are not fully understood by the experts in the individual sectors. Finally, a major challenge for the development community is that there has not been a systematic effort to strengthen the multi-disciplinary capacity to address the problems of food and security, malnutrition, and poverty. In what follows, we identify various issues that exemplify the need for multi-disciplinary capacity strengthening for agriculture, nutrition and health sectors. We begin with a conceptual framework to identify the entry points where such multi-disciplinary capacities are most needed. A value chain approach presented by Pinstrup-Andersen  could be useful to identify the areas of capacity strengthening. Natural resource base forms the basis for the sustainability of food production systems. Along with labor and other inputs, the variation in natural resource endowments decides the productivity of the food systems. Enhancing the productivity of the food systems has been the objective of the global agricultural research for the past forty years. Food produced is processed and nutritional and health outcomes of food consumed is influenced by the processing methods. Food access by the consumers depends on the market availability of food and prices of the food commodities. Recent food crises indicate that poor people are vulnerable to reduced food access if the food is not affordable. Market infrastructure along with food policies and institutions determine the accessibility and affordability of food. Further, the level of consumption of food along with clean water, sanitation, health, and care determine the nutritional outcomes for the society. 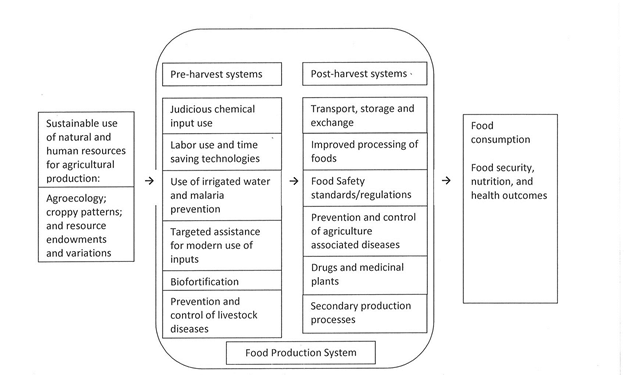 This conceptual framework can be used to connect the global food system with nutrition and health outcomes, and to identify the capacity strengthening needs at various levels. In addition to the capacity needs along the value chains, several emerging issues require multi-disciplinary capacity. We highlight a few below. Figure1: A conceptual framework for identifying multi-disciplinary capacity needs for food, agriculture, nutrition and health outcomes. One of the immediate threats to human health is the transmission of animal diseases to humans. Factors that force people to live with animals could trigger several infectious diseases in the future. Research to understand the disease transmission, surveillance of the diseases and early warning systems to alert the communities of the disease spread could help both the health and food systems. National capacity for conducting research and developing early warning systems are the immediate needs. Much could be done to prevent disease transmission from animals to humans if the international and national agencies that monitor diseases in humans and in animals could work together. Capacity at the global level is essential to track the incidence and transmission of such diseases. Food security and nutrition outcomes are influenced by the incidence of HIV/AIDS. The spread of HIV/AIDS in southern and eastern African countries has been dramatic in the last 20 years, and has had significant effect on the human resource development at all levels. The food systems’ productivity in much of Africa depends on labor availability. The morbidity and mortality associated with AIDS has threatened the food security in many communities. Addressing the challenges that HIV/AIDS brings to food systems and how the communities have coped through various strategies will require capacity at various levels. Policy makers and program managers also need to understand how the vicious cycle of low productivity of agriculture leading to environment that makes individuals vulnerable to infections and that it in turn reduces their ability to be productive once they are infected. The policy challenges here are clear. Having adequate capacity to deal with HIV/AIDS from a health perspective alone cannot help when messages from agriculture and nutrition sectors need to reinforce health interventions. Livelihood strategies that do not compromise health are also needed for families to get out of the vicious cycle. The benefits of having multi-disciplinary capacity that integrates food systems, health, and nutrition cannot be illustrated more clearly anywhere else than in the case of HIV/AIDS prevention, management, and control. Indiscriminate use of agricultural chemicals, environment-agriculture interaction and food safety issues are increasingly recognized to affect health and nutrition outcomes. Pesticides can help increase productivity of food systems and at the same time can bring unintended negative health consequences. Integrated pest management practices which reduce pesticide use can help. Rural health workers need to understand the unintended health consequences of agricultural chemical use. Cross-disciplinary capacity is needed to develop technologies that will help in judicious use of agricultural chemicals. Changes in agricultural cropping patterns and introduction of new crops can help improve micronutrient malnutrition. Increasing the diversity of crops grown in an agro-ecological area can improve the micronutrient availability as well. Recognizing biodiversity and using indigenous plants that are rich in micronutrients requires capacity at different levels. Scientific capacity to estimate nutrient content of crops along with knowledge of agro-ecosystem is needed for successful introduction of new crop varieties. Food safety systems are weak in African countries. Increasing the quantity of food alone is not enough for healthy living. Providing safe food is also needed to avoid food and water-borne diseases. Strengthening the food inspection systems and improving the methods of food storage and processing could minimize the contamination of food. This will require human resources that will engage in, and ensure food safety at various stages of food and nutrition value chains. Incorporating food safety issues and regulation in food and nutrition curricula is imperative to enhance such capacity at the national level.The primary stakeholder often forgotten in addressing food safety is the consumer. Policy issues related to food, nutrition and health have to be addressed jointly. Causal factors of poverty, food insecurity, and malnutrition are interrelated and require a cross-disciplinary understanding. For example, households caught in a poverty trap are afflicted by chronic conditions of poor health and malnutrition. Conditions of ill health, low nutritional status and poverty reinforce each other. Major health shocks can wipe out savings, erode asset base, and push households into poverty. Understanding the causal factors of poverty and their impact on households is important to device programs and policies. Protecting the vulnerable groups in the short run requires safety net policies and programs. Designed and implemented effectively, they can help in achieving food security, nutrition, and health goals. In the medium- to long-run, investment in research and infrastructure is needed to improve the food systems that could reduce poverty, increase food security, and eliminate hunger and malnutrition. Addressing such issues needs bringing together a multi-disciplinary group of experts at various levels. It further calls for breaking down the firewalls that exist between the disciplinary silos in the context of integrating the solutions that can help food, agriculture, nutrition, and health sectors. Strengthening multi-disciplinary capacity for agriculture, nutrition and health requires changes on several fronts. First, capacity strengthening development must start with an educational system that responds to the needs of the society. This will generate adequate innovation in offering new educational programs that will have multi-disciplinary content and focus. Faculty members offering cross departmental courses must be encouraged. Second, on the demand side, public, private, and civil society organizations should increase their uptake of graduates from cross-disciplinary programs. Hiring those with multi-disciplinary outlook will help in increasing such demand. Third, institutional strategies and policies should help in breaking the disciplinary silos. National agricultural, nutrition, and health strategies and policies need integration at the decentralized and at the national levels. This requires bringing together a group of experts from related disciplines who are able to work together to develop policies and programs. Fourth, rewarding innovations that involve multi-disciplinary and trans-boundary research efforts will help in promoting cross-disciplinary programs in research and academic institutions. Finally, an integrated approach to research and development is needed in agriculture, human health, and nutrition with adequate consideration to natural environments. The role of multi-disciplinary capacity, which this journal has helped to strengthen in Africa over the last 10 years, to enable such integration cannot be overemphasized. 1. Pinstrup-Andersen, P. The food system and its interaction with human health and nutrition, 2020 Conference Brief 13. 2011. Leveraging Agriculture for Improving Nutrition and Health, International Food Policy Research Institute. Washington, D.C.